The occupations and release of a detailed platform reveal a new level of coordination by Black Lives Matter on the anniversary of Michael Brown's death. The two-year anniversary of the death of Michael Brown came yesterday, August 9, prompting vigils and marches around the country. While the rage and grief that ignited the streets of Ferguson two years ago remained a clear subtext in these gatherings, events surrounding the anniversary of Brown’s death also demonstrated the levels of pragmatism and coordination that have emerged among organizers since the chaotic summer of 2014. The weeks leading up to August 9 have been busy for Black Lives Matter and its allies. Organizers mounted several major occupations in the past month, beginning with #DecolonizeLACityHall on July 12. In Chicago, activists were in their 19th day of occupying “Freedom Square” yesterday when they paused to honor Brown’s memory with a moment of silence followed by a march. These activists, who include Black Lives Matter members and groups like Let Us Breathe Collective and the Black Youth Project 100, have also taken to the streets in Chicago recently in response to the death of Paul O’Neal and to protest a proposed “Blue Lives Matter” ordinance. In New York City, activists associated with Black Lives Matter launched a campaign called #ShutDownCityHallNYC on August 1 to draw attention to their demands for police reform, which include the resignation of NYPD Commissioner Bill Bratton, reparations for victims of police violence and defunding the police and reinvestment in the community. A day later, Bratton announced his resignation. (Mayor de Blasio claimed the decision was “110 percent unrelated” to the Black Lives Matter protests.) A rally in honor of Brown’s memory is also slated to be held August 13 in New York’s Union Square. 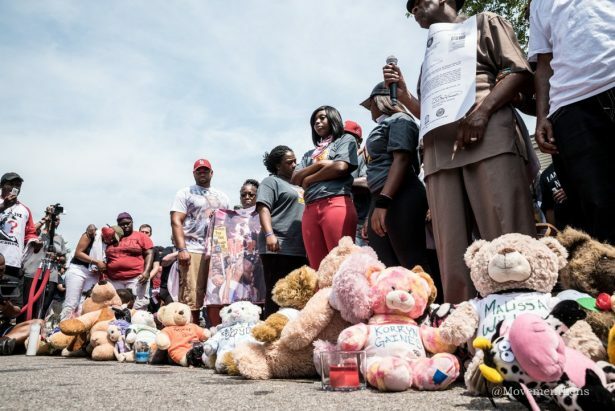 In Ferguson itself, commemorative events began last week and included a “Walk for Justice” and other events sponsored by the organization founded in Michael Brown’s memory, Chosen for Change. On Tuesday, several hundred supporters gathered for a daytime vigil in honor of Brown’s memory. That evening, as about 75 supporters dispersed from a memorial church service, a passing car struck a member of the crowd, then sped away. Witnesses reported hearing gunshots fired in the wake of the collision. According to a city spokesperson, the incident appears to have been an accident; two people were taken to a nearby hospital. The past few weeks have been busy for the Movement for Black Lives as well. On August 1, the group, along with a coalition of over 60 affiliated organizations, put forward a detailed platform of demands and policy proposals. Yesterday, the Black Lives Matter organization issued a public call for a four-and-a-half minute “moment of silence” to recall the four-and-a-half hours Brown’s body was left exposed in the street. Please reflect on your name, “Waging Nonviolence” and the three word name for the movement “Black Lives Matter”. William Bratton deserves much of the credit for saving thousands of lives, disproportionately black lives from low income high crime neighborhoods. He can honestly say “Black Lives Matter” to him. Police need to continue to improve how they serve minority residents but much progress has been made. Compare homicide rates in New York and Chicago in the years since Bratton started making reforms. Chicago continues to have high rates of killing while New York saw a 63% reduction in crime. Ironically Black Lives Matter has demanded Bratton be fired for doing the one thing they profess to care about, saving thousands of black lives from homicide. Waging Nonviolence is now celebrating the life of Mike Brown, a violent criminal who had robbed and assaulted a convenience store clerk and then contributed to his own tragic death by attempting to take a police officer’s gun. Brown might be alive today if police did a better job but he could have saved his own life by putting his hands up. That could be a lesson that would prevent more violence. The “chaotic summer of 2014” involved burning and looting the black majority Ferguson business district, throwing rocks and gunfire. This is “racial justice”? The business and political elite, both black and white, Black Lives Matter and liberal activists tolerate an epidemic of homicide in poor neighborhoods as long as their middle and upper class neighborhoods are safe places to live. One thing I’ve learned from older residents in my black majority neighborhood is that we’re on our own because very few outside the neighborhood care except police and they are limited by resources given to them by the city. Community policing with support from neighborhood residents has been an effective way to save lives. Once residents gain enough trust to report crime police can be effective as they are in normal neighborhoods. We are no longer a high crime neighborhood. Black Americans are almost eight times as likely as white ones to be homicide victims. This number is misleading because black people with the means to move have left high crime areas behind and moved to safe areas. Young men in high crime areas may face a homicide rate hundreds of times greater than that for the privileged organizers of Black Lives Matter. Six thousand black people will be victims of homicide this year and every year until we decide that this is no longer acceptable.